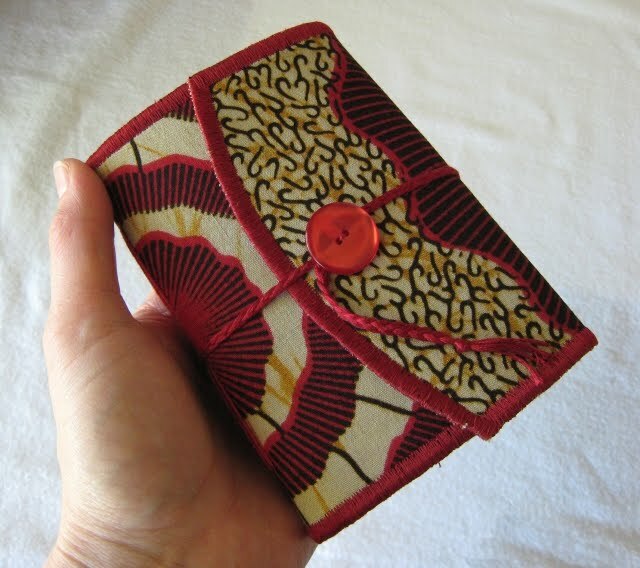 Laura of PrairiePeasant has contributed a fabric softcover mini book made from batik fabric her husband brought back from Burkina Faso, Africa. 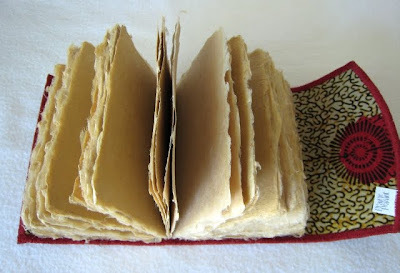 It's filled with handmade paper from a Winnipeg paper company called Botanical Paperworks and bound with cotton embroidery floss in a longstitch binding. You can find more fabric journals, as well as a variety of other books and paper goodies, in Laura's shop: prairiepeasant.etsy.com. This fabric is amazing, I love this book! CinderLisa, I'm looking forward to receiving whatever you've sent my way! Your work is quite lovely, and I can't wait to see what comes in the post. Kristin, I'm so glad you like this book! I hemmed and hawed about it before deciding what to send to you, so I'm glad I made the right choice. each element of this book compliments the others -- a perfect design. I can see the attention to details and quality of this beauty. The fabric is lovely and I'm sure the pages are very inspiring!